As you probably know, Applebee's has a Weight Watchers menu packed with interesting, fairly low-point and low-calorie items. We tried a whole slew of 'em. Here's our take on the guilt-free options at The 'Bees. Of all the items on <?/x-tad-bigger><?color><?param 0000,0000,EEEE><?x-tad-bigger>Applebee's Weight Watchers Menu<?/x-tad-bigger><?/color><?x-tad-bigger>, the <STRONG>Onion Soup au Gratin</STRONG> was, by far, our absolute favorite! This 150 calorie, 8g of fat, 3 WW point soup is loaded with oodles of delicious perfectly cooked onions and topped off with yummy bread and lots of melted reduced-fat cheese. This soup is so good it almost made us cry (and no, that had nothing to do with the onions).</div></TD> <TD width=20></TD></TR> <TR bgColor="#b2e7f4"> <TD colSpan=5 height=10></TD></TR> <TR> <TD colSpan=5 height=20></TD></TR></TBODY></TABLE></TD></TR><TR bgColor="#b2e7f4"> <TD vAlign=top width="100%" colSpan=2> <TABLE cellSpacing=0 cellPadding=0 width="100%" border=0> <TBODY> <TR> <TD colSpan=5 height=15></TD></TR> <TR> <TD width=20></TD> <TD vAlign=top style=" COLOR: #000000; FONT-SIZE: 13px; FONT-FAMILY: Palatino Linotype, Georgia, Times New Roman; LINE-HEIGHT: 18px;"><div><SPAN style=" FONT-WEIGHT: bold; COLOR: #000000;">Go Fish!</SPAN><BR><BR>Our clear favorite of all of the entrees was the 320 calorie, 6 gram of fat <STRONG>Grilled Talapia with Mango Salsa</STRONG> (7 WW points). We skipped the rice and ordered double veggies. The folks at our local Applebee's were more than happy to fulfill that request. The Talapia was flaky, fresh and not fishy at all. And the mango salsa was filled with spicy tropical goodness. The Tortilla Chicken Melt (480 calories, 13g fat, 6g fiber - 10 WW points) and Sizzling Chicken Skillet (360 calories, 4g fat, 10g fiber - 7 WW points) also got "two yums up" from us! Impressive work, Applebee's! There are two salads on the WW menu at The 'Bees, and both are good. The Mesquite Chicken Salad (250 calories, 4g fat, 7g fiber - 4 WW points) was tasty but we weren't thrilled with the barbeque ranch dressing. It was a bit watery and it sort of tasted like Band-Aids. Really. Ask for the dressing on the side and try it out yourself. 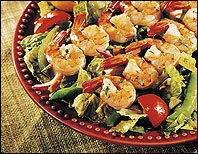 Their new Shrimp Skewer Salad (210 calorie, 2g fat, 7g fiber - 3 WW points) was even better. We actually think this salad is the "find" of the century! Three points for a giant bowl of lettuce, tomatoes, purple onions and sugar snap peas, all topped with TWO skewers of yummy shrimp?! Yowsa! There are 10 shrimp on this salad. So awesome! Again, we didn't love the dressing. Frankly, it was odd. It was thick and gloppy -- and although it was supposed to taste like lemon herb something or other, it tasted a lot like dill pickles to us. We actually used a little of the teriyaki sauce from our skewers on our salad, and it was dee-lish! The Teriyaki Steak & Shrimp Skewers are a fairly new addition to this menu, and we love them. You can order them three ways. Just shrimp (290 calories, 2g fat, 7g fiber - 5 WW points) , just steak (460 calories, 12g fat, 7g fiber = 9 WW points), or a combo of both (370 calories, 7g fat, 7g fiber - 7 WW points). They're great any which way you get 'em, but we think mixing it up and ordering both shrimp and steak is a good idea. The shrimp is the same as the shrimp skewer you get on the salad and the steak is really tasty. It's served with rice pilaf, which was just so-so (and quite the tiny portion), and steamed veggies. We like the veggies -- they had some sort of herbs sprinkled on them. They were pretty dry, but we like 'em that way. This meal was great...and the portion was pretty big, too! We're not gonna sugar-coat it. The Tango Chicken Sandwich (370 calories, 9g fat, 8g fiber - 7 WW points) was an absolute disaster. It's supposed to be "grilled and seasoned chicken breast topped with reduced fat cheese and a barbecue ranch sauce, served on a toased wheat bun." For starters, the actual piece of chicken was TINY. But that actually turned out to be a blessing in disguise because it tasted horrible. It was salty and, again, had that Band-aid-ish flavor (must be the barbecue ranch sauce). Also the chicken was rubbery and didn't even taste like real chicken breast. The chicken at Burger King was actually ten times better. Even the bun was a big fat disappointment. It was too big, plus it was dry and icky. We say this sandwich may in fact be the world's biggest waste of 7 points (or 370 calories). It also didn't help that a man at the table next to us was eating what looked like a "normal" chicken sandwich from their regular menu. The chicken on it looked GREAT and was the size of Texas. Sad times. Here's the deal with the desserts. Both the Berry Lemon Cheesecake (230 calories, 7g fat, 2g fiber - 5 WW points) and the Chocolate Raspberry Layer Cake (230 calories, 3g fat, 3g fiber - 4 WW points) impressed us. And neither is terribly high in points or calories. The cheesecake, which is actually a scoop of cheesy mousse, has a bit of an overpowering artificial lemon flavor. But it's deliciously disguised by berries and berry-flavored sauce. The Chocolate Raspberry Layer Cake was pretty moist and not bad, though it was a little small (there's no denying that when it comes to cake, size matters). Bottom line: if given the choice, we'd wait 'til we got home to scarf down a Skinny Cow ice cream sandwich smothered in fat free whipped cream (around 150 calories, 3 points). But if everyone else is ordering dessert and you want be be part of the eating frenzy, by all means order one. You won't be disappointed. October 14th is National Dessert Day. Whip up some of HG's famous Rockin' Dessert Recipes. They do rock. It's a fact. Share this email with everyone. Click our "send to a friend" button and let the fun begin! Pssst...Check out the great Hungry Girl Starbucks debate on The Sneeze. Apparently one of HG's tips upset a coffee shop manager. Check it out and "weigh in" NOW.